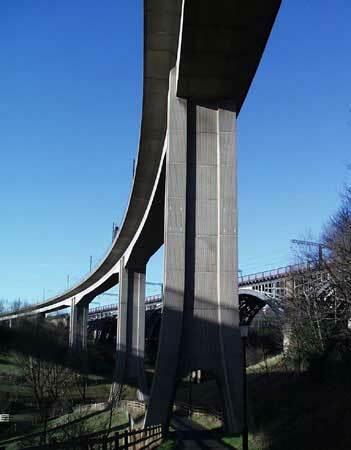 The Byker Metro Bridge over the Ouseburn between Newcastle and Byker. Opened: 11th November 1982 as part of the St. James to Tynemouth section of the Metro system. Designer/Engineer: Ove Arup and Partners. Contractor: John Mowlem. Traffic: Rail. (Metro Rapid Transit). Length: 2674 ft (815m). Width: 27 ft (8.2m). The Byker Metro Bridge was opened as part of the official opening of the St. James to Tynemouth section of the Metro Rapid Transit system November 11th 1982.